While most of Essex-class vessels were decommissioned in the 1970s, the last still in service, the USS Lexington, remained active as a training ship until 1991. Four of the World War II fleet carriers still serve as museum ships in New York, South Carolina, Texas and California. The decades of operational service provided by the venerable carriers testified both to the robustness of their design, and their effectiveness as platforms of the U.S. naval power. Perhaps no vessel embodies the U.S. Navy’s embrace of the aircraft carrier as the centerpiece of its strategy as the Essex-class carrier. Between 1943 and 1950, twenty-four of the thirty-thousand-ton carriers were built at shipyards in Newport News, Philadelphia, Brooklyn, Norfolk and Braintree—some completed in as few as fourteen months. This makes the Essex the most extensively produced capital ship class in the twentieth century. The Navy’s earlier carriers were limited in size due to the Washington Naval Treaty signed in 1922, with an exception granted for two battlecruisers converted into carriers with displacements of thirty thousand tons (in U.S. service, the Lexington-class). Though lacking combat experience, the Navy tested its carriers extensively in wargames and gained a decent idea of their revolutionary. So did Japan, which withdrew from the Naval Treaty in 1934 to build up its forces up for planned future conquests. Reciprocally freed from the treaty’s restriction, in 1940 the Navy set out to build a larger carriers than its latest Yorktown-class. Though the U.S. was over a year away from involvement in World War II, naval engineers grasped the qualities a fully-capable carrier needed: when it came to ‘flattops’, bigger was actually better. The 30,000 ton Essex was finally commissioned on December 31, 1942, measuring 265 meters in length and displacing 31,300 tons with the hull reinforced by as much as four inches of Special Treatment Steel armor. Four twin and four-single five-inch gun turrets used two fire-control radars to blast aerial threats up to seven miles away using proximity-fused air-bursting shells. Additionally, sixty rapid-firing twenty-millimeter cannons and seventeen quad-barrel forty-millimeter Bofors guns provided close protection. Additional air- and surface-search radars gave the carriers advance warning of approaching threats while helping manage friendly forces in the battlespace. A new side-mounted elevator gave the carriers better flexibility, particular in the event that the elevator was jammed by battle damage. She and her sisterships officially had crew complements of 2,300 personnel, though often sailed with more than 3,000. Eight huge boilers generating temperatures of 850 degrees Fahrenheit turned four steam turbines for electrical power and propulsion, allowing the hulking carrier to achieve 33 knots under full power. The Essex’s best defense and offense came from the new generation of aircraft she carried, all with ranges of a thousand miles or longer. Agile F6F Hellcat finally helped the Navy win air superiority over maneuverable, but fragile A6M Zero. Faster SB2C Helldiver bomber could heft up to two-thousand pounds of bombs internally, and another thousand underwing. And tubby three-man TBF Avengers could launch deadly torpedo attacks, and also proved effective as radar-equipped submarine hunters and airborne early warning plane. The air groups typically boasted two squadron each of Hellcats and Helldivers and a squadron of Avengers. The Essex’s larger deck allowed two squadrons to be “spotted” for takeoff on the flight deck, while a third readied its engines on the open hangar deck below. As aircraft carried progressively heavier weapons loads, they began to make more extensive use of the Essex’s two to three steam catapults to achieve necessary takeoff speed. An enlarged store of 240,000 gallons of aviation fuel enabled extended flight operations. Starting with the Ticonderoga laid down in 1943, new long-hull Essex carriers entered service with a flared ‘clipper bow meant to handle rough weather more smoothly. The long-hull ships boasted additional anti-aircraft guns and improved radars, and had their refueling and air vents reconfigured for improved survivability, and the ship’s Combat Information Center moved below deck. In fact, as Essex carriers received near continuous upgrades to their radars, guns and catapults, no two came to be exactly alike. The Essex carriers were thrust into the cauldron of the Pacific War which had already consumed five of the eight fleet carriers the Navy began the conflict with. Many of the Essex class vessels were renamed after recently sunk carriers (Yorktown, Lexington, Wasp, Hornet, Independence) as well as other famous ships and historic battles. Initially they primarily served as floating airstrips to pound fortified Japanese islands in the United States’ relentless island-hopping campaign. However, in June 1944 six Essex class-carrier engaged Japanese counterparts in the Battle of the Philippine Sea, sinking three Japanese carriers and shooting down around six hundred aircraft in the so-called “Great Marianas Turkey Shoot.” The U.S. Navy lost 123 combat aircraft and no ships. Fourth months later, four Essex-class carriers covering the U.S. landing on the Philippines fought off three separate Japanese fleets in the epic Battle of Leyte Gulf, the largest naval battle in history. Aircraft from the Essex and Franklin (as well as from the Yorktown-class Enterprise) sank the Japanese battleship Musashi, the largest battleship ever built. Again, the Essex-class carriers survived Japanese counterattacks unscathed thanks to effective Combat Air Patrols. However, in the final year of the war Japan launched increasing numbers of Kamikaze attacks that succeeded in penetrating the Essex’s formidable air defense screens. On May 11, 1945, while providing air support for the invasion of Okinawa, the Bunker Hill was simultaneously struck by two Zeroes also carrying bombs, the massive explosions killing 390 crew. She nonetheless managed to return to Pearl Harbor for repairs on her own power. Another Essex-class carrier, the USS Intrepid, survived being hit by four Kamikaze attacks as detailed in this earlier article. Earlier, on March 19, 1945, the Franklin was struck by two armor piercing bombs dropped by a lone D4Y “Judy” dive bomber, setting off an chain reaction of exploding bomb and fuel laden aircraft that killed over eight hundred crew. Remarkably, Franklin captain refused to abandon ship and managed to nurse her back to port, having suffered the heaviest casualties for any U.S. Navy ship not lost in action. You can see footage of the Franklin’s ordeal in this 1945 documentary. Ultimately, not one Essex-class carrier was lost during World War II. The close of hostilities saw the cancelation of eight planned Essex carriers. But most of the remaining twenty-four would lead long and eventful service lives. 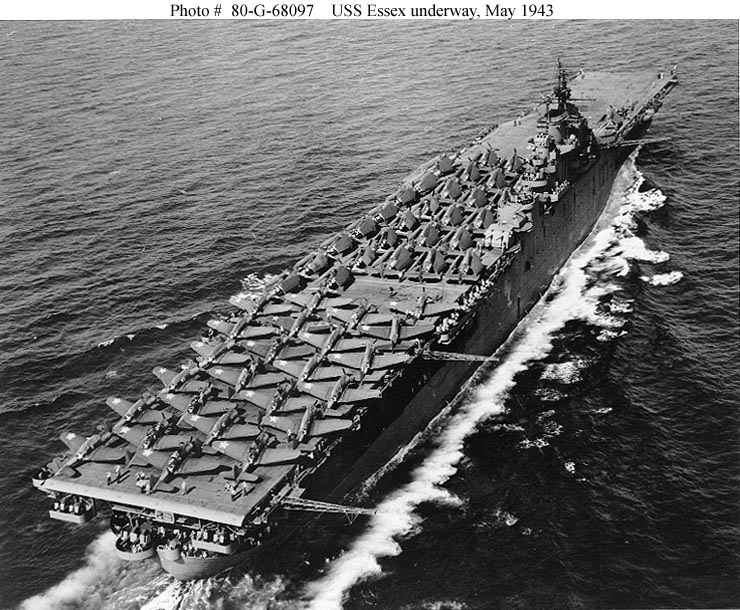 The Navy reconfigured its Essexes with angled flight decks (increasing their weight to forty-seven thousand tons) and mirror landing systems to help operate faster and heavier jet fighters like he F9F Panther and the FJ Fury, serving alongside trusted piston-engine fighters like the Corsair and the beastly A-1 Skyraider. Helicopters were also added for search-and-rescue duties. Eleven of the Essex carriers saw action in the Korean War, hitting ground targets in North Korea. In one incident in 1952, a Panther launched from the Essex-class Oriskany shot down four Soviet jets in an aerial skirmish over the Sea of Japan. A decade later the Essex’s continued to serve, now with Skyhawk attack jets, speedy F-8 Crusader fighters, which saw action in the Vietnam War, with A-1s from the Intrepid even improbably shooting down a MiG-17 jet fighter. The carriers were also extensively employed to recover NASA space capsules and astronauts. However, the Essexes were being replaced by new nuclear-powered carriers. However, the Oriskany—the last Essex-class vessel launched in a heavily modified configuration—endured the class’s final ordeal when a mishandled flare tossed into an ammunition locker ignited a fire that vented poisonous fumes throughout the ship, killing forty-four.